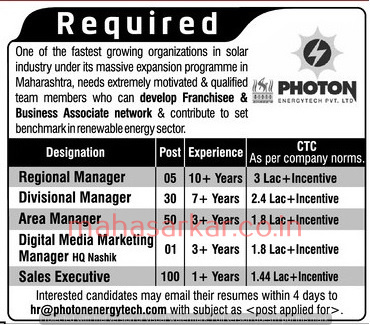 MAHA Photon Energy (Photon Energytech Pvt Ltd), Nashik Published Job Notification for 186 Sales Executive – Area Manager & More Posts. Candidates who wish to apply must look at MAHA Photon Energy Sales Executive – Area Manager & More Recruitment 2018. Eligible candidates can apply Online before 16-05-2018. Interested & Eligible candidates can send their application along with all the necessary documents and testimonials to hr@photonenergytech.com with subject as <post applied for>. Starting Date, Last Date to Apply Online at Photon Energytech Pvt Ltd which candidates should be remembers as follows. Start Date to Apply Online: 12-05-2018. Last Date to Apply Online: 16-05-2018.